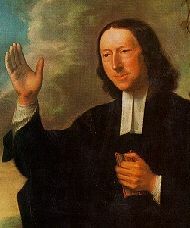 John Wesley, the celebrated preacher and founder of the Methodist Church, was a life-long opponent of slavery. His biography is well known, and is told in many places, both on the web and in many published works, so this article will focus mainly on his activities as a campaigner against slavery. His opposition to slavery and the slave trade began long before the issue had received widespread attention, and was sustained throughout his life. Indeed, his attitudes to slavery were formed early. In 1736-7 Wesley visited the then British colony of Georgia in North America where he came into contact with slaves. At the same time, he read Thomas Southerne's play Oroonoko, which was based on Aphra Behn's novel of the same name, and which related the tragedy of Oroonoko, an African prince kidnapped and sold into slavery. On his return to England, he passed the time on the long transatlantic voyage by teaching a young black man, presumably a slave, how to read and write. Wed. 12.-In returning I read a very different book, published by an honest Quaker, on that execrable sum of all villanies, commonly called the Slave-trade. I read of nothing like it in the heathen world, whether ancient or modern; and it infinitely exceeds, in every instance of barbarity, whatever Christian slaves suffer in Mahometan countries. Are you a man? Then you should have an human heart. But have you indeed? What is your heart made of? Is there no such principle as Compassion there? Do you never feel another's pain? Have you no Sympathy? No sense of human woe? No pity for the miserable? When you saw the flowing eyes, the heaving breasts, or the bleeding sides and tortured limbs of your fellow-creatures, was you a stone, or a brute? Did you look upon them with the eyes of a tiger? When you squeezed the agonizing creatures down in the ship, or when you threw their poor mangled remains into the sea, had you no relenting? Did not one tear drop from your eye, one sigh escape from your breast? Do you feel no relenting now? If you do not, you must go on, till the measure of your iniquities is full. Then will the Great GOD deal with You, as you have dealt with them, and require all their blood at your hands. About the middle of the discourse, while there was on every side attention still as night, a vehement noise arose, none could tell why, and shot like lightening through the whole congregation. The terror and confusion were inexpressible. You might have imagined it was a city taken by storm. The people rushed upon each other with the utmost violence; the benches were broke in pieces, and nine-tenths of the congregation appeared to be struck with the same panic. Wesley ascribed the confusion to "some preternatural influence. Satan fought, lest his kingdom should be delivered up." A more likely cause, perhaps, was a plot by slave-traders, anxious to disrupt a piece of abolitionist rhetoric being sounded deep in their territory. How strong this rhetoric was is impossible to tell as the 1788 sermon has not survived. Nonetheless, it is reasonable to assume that it was based in some measure on his pamphlet Thoughts Upon Slavery which was strongly argued. Wesley maintained an interest in the abolition movement until the end: on his death-bed, he was reading the Interesting Narrative of Olaudah Equiano, a text which Wesley discussed in his last letter - to William Wilberforce - written six days before he died, on 2 March 1791. Green, V.H.H., John Wesley (London and New York: University Press of America, 1987). Useful, academic biography. Pollock, John, Wesley the Preacher (London: Lion, 1989). Readable, popular biography. The full text of Thoughts Upon Slavery. Another full text of Thoughts Upon Slavery, with an image of the title page.